The event, learning, links, and timeline page have been updated, including photos of the recent Four Corners to Fukushima events. Check back often to find out about more related events coming up, and visit our links page to find out about what other organizations are up to. A new website, http://www.nuclearfreezone.org, was recently created to house the Four Corners to Fukushima events. 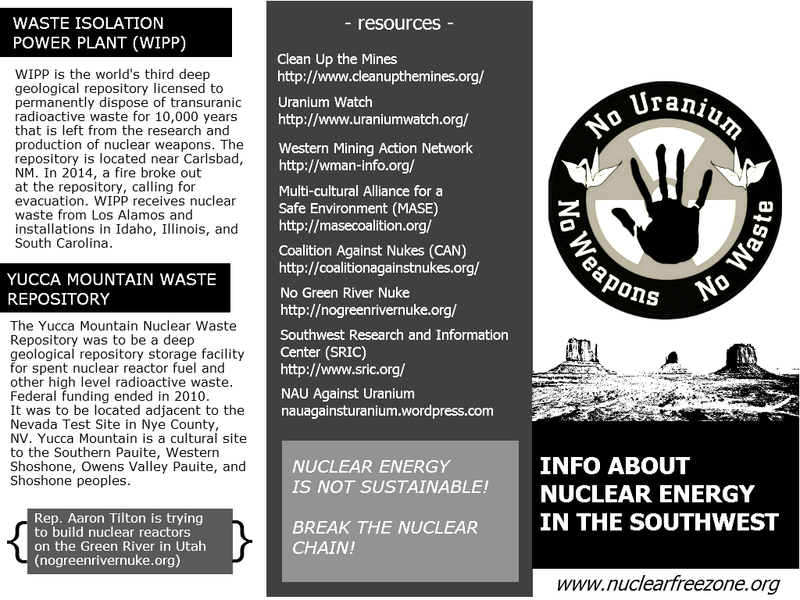 Be sure to look at this page for all things against nuclear in the Southwest region! March 11th, 2014 marks the third year anniversary of the Fukushima Daiichi Nuclear Power Plant disaster in Japan. Triggered by an earthquake and consequential tsunami, the power plant failed and released massive amounts of radioactive materials, irradiating the community and land base around it. The meltdown is the largest nuclear disaster in the world since the Chernobyl disaster in 1986. Radiation on both sides of the Pacific ocean have increased by hundreds of percents. Unfathomable amounts of radioactive material have been dumped into the Pacific ocean everyday since the failure in 2011. Still, the fourth unit of the nuclear plant containing a spent waste pool is unstable and could collapse. The fuel in reactors two and three are believed to have melted down and out of their concrete containment vessel. Amongst the urgency to take action, the Japanese government and Tokyo Electric Power Company (TEPCO) refuse to act entirely responsible. Worldwide media coverage has been sparse. In spite of this, the nuclear industry in the U.S. continues to “green-wash” their social and environmental footprints. 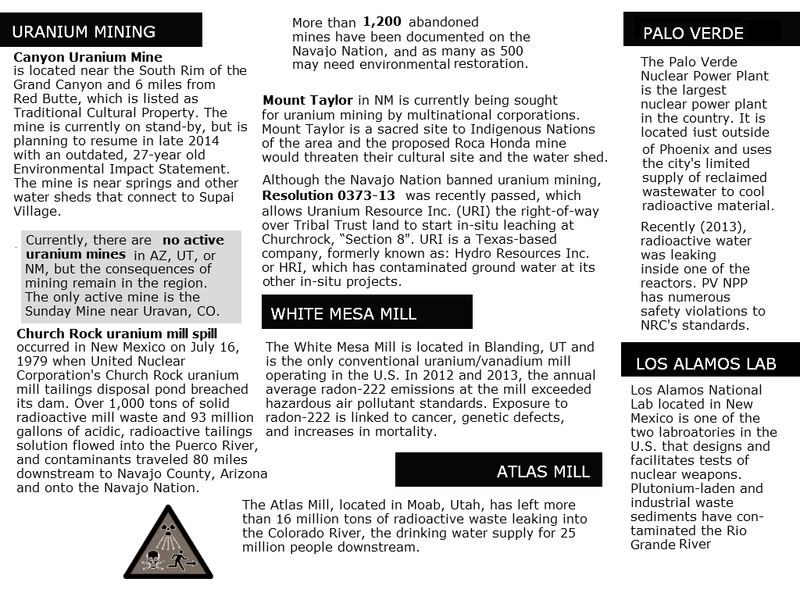 There has even been a renewed push for uranium mining in the Southwest. New nuclear power plants continue to be built and many old plants that are due for decommission have received 30-year extensions on their permits to operate. The Nuclear Regulatory Commission admits there is still no long term plan for power plant waste storage. Some of this waste has a 300,000 year half-life which is longer than modern humans have lived on earth! There is little accountability on the part of mine owners and the government to clean up dangerously radioactive abandoned mines, contaminated water wells and rivers, and financially support those made ill from exposure and consumption of radioactive material. The Palo Verde Nuclear Power Plant located near Arizona’s capitol is the largest nuclear power plant in the country. The plant requires 82 billion gallons a year of Phoenix’s reclaimed wastewater in order to cool it’s reactors and is the only nuclear plant in the U.S. not built near a large body of water. Massive amounts of water are necessary should a meltdown occur, yet Phoenix is already projecting water shortages by 2020. In 2013 contaminated water leakages were found forcing the entire power plant to be evacuated. Palo Verde NPP ranks near the top in the country for safety violations according to the Nuclear Regulatory Commission (NRC). When will we draw the line? Nuclear power and weapons are not sustainable – they are an affront to all life on Earth. Organize an event in your community on or around March 9th (the day people in Japan are holding their events) to show support for communities directly effected by the nuclear industry and to raise our voices against nuclear power and weapons. Together, we are capable of breaking the nuclear chain! It has been over a month since we delivered over 1,500 petition signatures to the Kaibab National Forest requesting a new Environmental Impact Statement for the Canyon Uranium Mine. The Canyon Mine is planning to operate under their current, 28-year old one. Please sign this letter, especially if you were born after 1986, asking for a response from the Forest Service. 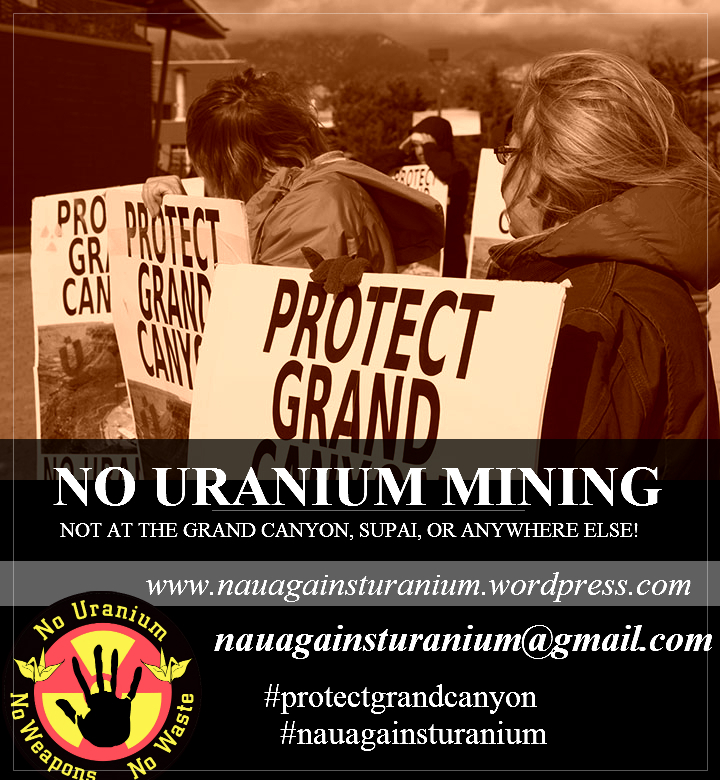 Email this letter with your signature to nauagainsturanium@gmail.com. We’d like to mail it toward the end of this week. We are writing to you on behalf of those who signed the petition delivered to the Kaibab National Forest Headquarters on December 13th, 2013. It has been over a month and hundreds of us are still awaiting a comment or personal response from you or your office about supplemental information that deems the current, 28-year old Environmental Impact Statement for the Canyon Uranium Mine as antiquated. Although the Canyon Uranium Mine is currently closed, many people are deeply concerned about this mine, how our, the younger generation, are being excluded from the NEPA process. We are concerned about when it may re-open, its proximity to Red Butte, which is recognized as traditional cultural property, to the Grand Canyon, and important water ways. This is especially true for us, who are were not born or who were too young to take part in the EIS scoping process, who will more directly face potential consequences from the Forest Service’s decision to allow the mine to operate. The signatories recognize the social and cultural impacts of mining, and the numerous scientific advancements that have happened since 1986 that allow us to better measure the effects of uranium mining on the local environment and hydrology. Youth and new science should require an EIS that reflects the present – that takes new information, and a whole generation, into account. We sincerely look forward to hearing your response to the petition at your earliest convenience.